Butter a 1 1/2 quart baking dish. Heat oven to 350°F. Steam the diced eggplant just little tender, about 5 minutes. Heat oil in a large skillet over medium heat. Add the onion and bell pepper and saute, stirring, until onion is tender. Add the garlic and saute for about 2 minutes longer. Remove from heat. Spread bread slices with the butter and cut into cubes. Stir the eggplant and bread cubes into the onion mixture. Let the mixture cool slightly. Stir in the beaten eggs, salt, pepper, thyme and marjoram. Stir in the half of the Kraft Shredded Cheese. 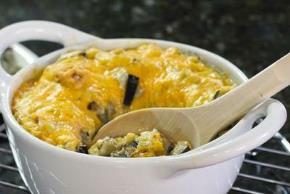 Spoon the mixture into the prepared baking dish and cover with the remaining Kraft Shredded Cheese. Bake for 20-25 minutes, until lightly browned. Serve hot.